Public Health Minister Anna Soubry has announced a commitment of £250 million of funding for state-of-the-art Proton Beam Therapy cancer treatment centres in London and Manchester. The centres will be established at University College Hospital and The Christie in Manchester, making this advanced form of radiotherapy available in the UK for the first time. UCL is working with UCLH on the construction of the London facility, accompanied by an extensive research programme to improve this cutting-edge cancer treatment. Proton Beam Therapy (PBT) is a much more precise way of targeting tumours. With conventional radiotherapy, X-rays not only damage the tumour but also the surrounding tissue, which can have significant side-effects. Protons, however, deposit much more energy exactly where it is needed, destroying the malignant cells but sparing much more of the surrounding healthy tissue. This is most important for deep-lying tumours growing near highly sensitive tissue, such as the optic nerve and the brain, particularly when treating children. By reducing the dose to the healthy organs of growing children, significant side effects in later life - such as secondary cancers, growth abnormalities, hearing loss or learning difficulties - can be avoided. Currently, the NHS sends only a selection of children and adults needing Proton Beam Therapy to the United States, but from 2018 some 1,500 cancer patients with the most complex tumours will be treated at UCLH and The Christie. This government commitment to increasing access to advanced radiotherapy treatments will significantly improve the experience for patients and their families who currently have to travel long distances for treatment, as well as giving UCL researchers the opportunity to improve these techniques. The technology used for this advanced form of radiotherapy comes from an unlikely source: the study of sub-atomic particles. Particle physics isn't just for exploring the origins of the universe. The accelerator technology used in proton beam therapy comes directly from that developed for enormous atom-smashers, like the Large Hadron Collider, which are used to investigate the most fundamental building-blocks of nature. Without that pure research we wouldn't have developed these tools for cancer treatment. "Particle physics isn't just for exploring the origins of the universe," says Dr Simon Jolly, accelerator physicist at UCL Physics & Astronomy. "The accelerator technology used in proton beam therapy comes directly from that developed for enormous atom-smashers, like the Large Hadron Collider, which are used to investigate the most fundamental building-blocks of nature. Without that pure research we wouldn't have developed these tools for cancer treatment." The strength of this new kind of radiotherapy is its ability to precisely target, so engineering skills are crucial to sculpt and direct the beam of particles as a medical tool. Equipment, controls and simulations developed by medical physicists and beam engineers will make the particle stream customizable in width, energy and time of pulse. Accurate targeting of the cancerous cells is made more difficult by any movement of the patient's body. Medical imaging specialists can help here, by developing analysis techniques to identify and lock-on to the targets within a medical scan. If the calculations are correct then the protons will damage the cancerous cells irreparably, destroying the tumour. Even the beds in which the patients rest while receiving treatment need to be carefully engineered, so the beam can be lined up accurately and pass through the support if needed for 360° access. developing computing techniques to reliably extrapolate from the small data sets clinical trials produce. 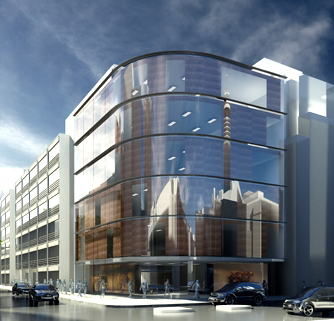 The building of this new centre, between UCLH and the new Macmillan Cancer Centre and only a stone's throw from the main UCL campus, presents many opportunities for engineers and physicists in the service of patient care and developing the abilities of medical treatment, as well as providing therapy to patients close to their homes. UCL Engineering's expertise in radiotherapy and medical physics is well-suited to this massive endeavour, ultimately culminating in better treatment for some of the most vulnerable patients. As Gary Royle, Professor of Radiotherapy at UCL Medical Physics & Bioengineering, says: "Proton therapy is a highly technical form of cancer treatment that sits at the interface between a variety of disciplines across engineering, science and medicine. A state-of-the-art proton therapy clinic on UCL's doorstep will enable the considerable research expertise that exists across the campus in each of those areas to directly benefit UCLH cancer patients and truly advance the field."